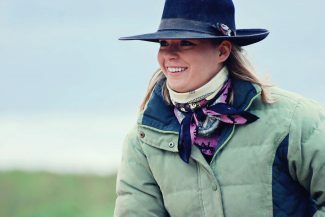 Savanna Simmons is a ranch wife, mother to two young cowboys, and horseman. She has a degree in Communication Arts with an emphasis in Journalism from Chadron State College, Nebraska. She was born and raised in Wisconsin and pursued horsemanship. She grew up riding with some of the greatest horsemen, including Ray Hunt, Joe Wolter, and Jack Brainard. After earning her degree, she married a rancher and never looked back. She and her husband Boe and boys Brindle and Roan have lived north of Lusk, Wyoming, on a cow-calf and yearling operation ranch since 2014. Savanna enjoys photography, and her photos are often published alongside her writing.